This morning's fartlek training was painful. Not sure if I didn't stretch enough or what but I couldn't find my grove on the skates and before I knew it my time was up. Nevertheless, my standard measures of overall time and interval time showed I trained well today. For instance, during my fastest mile routine I felt horrible! But I did it in 3 minutes and 30 seconds (that's 17 mph). I really thought it was going to be a 5 minute mile. On the return route home there is a slight decline about 100 yards long where I like to practice form at a faster speed. I try to get a low as I can and move my legs in proper motion. Form is important so I didn't care much about how fast I was going to go - but this morning I changed things a bit. I decided to crank it up because at the bottom of the hill there is one of those electronic speed trap signs...ya'know, the signs that flash the speed of an approaching car. The sign flashes the speed faster and faster if the car is over the speed limit. I reached a speed of 34 mph as I passed by. The speed limit was 25 mph so the sign was going crazy. I looked around and there were no other cars that could have been tripping the motion sensor of the sign. Fun. The passion that pours out when professing Christians talk (or blog) about film entertainment is analogous to the gushing energy that ignites when people (anyone) talk religion and/or politics. What a study in Sociology and personal conviction! I could go in so many directions with this post. Instead, I am sorry but you'll have to accept a few short thoughts I have in response to the comments on a post I made a few days back about the movie Evan Almighty. I wish I could go back and rewrite the post. There are too many blogs to read out there - too much blog noise. I should have known better than to post an incomplete thought. More or less the post was a reaction to something I read at Challies. But what do I know? I am just an amateur writer/blogger. I believe the primary point of my post was missed. It certainly wasn't to bash Evan Almighty and condemn it as anathema (I'd have to see the film to legitamtely do that.) I absolutely was not taking a moral stand by calling all Christians to stand against the movie. Furthermore, whether I see the movie or not I most definitely have no authority to condemn anyone to hell fire if they should choose to view the film. This one I have been thinking about a lot. How is what Challies posted on Evan Almighty here a review of the movie itself? I agree with the absurdity that one can actually review a movie without actually seeing it. Challies didn't review the movie, he voiced his opinion as to what he was thinking about a certain topic (aahhh...the fantastic freedom that comes with blogging!). Challies expressed how he arrived at a decision to not view Evan Almighty. Was he calling all Christians to condemn the film? No, I don't thing he was. I just reread Challies' post and still empathize with his concerns - but that is not a review of the movie. Now the comments following Challies' post are another story. I stopped reading after number 15 or so. I agree, those comments showed the glaring cultural ignorance of Evangelical Christianity and supports the reason why Christians are considered cultural fools. Another perspective of my original post was the intensity of the marketing of the film to "Christians". In the days prior to the film's release it seemed like there was a major effort to plug the flick to and through all things "Christian". Why is this even necessary? Geez, even Dobson had something to say about the movie. Also, one of my friends forwarded me an email from a radio station offering him an invite to a special pre-screening. Why was all this marketing necessary? If I were to rewrite the post I'd explain what I think more thoroughly. My opinion is that the marketing was needed because the film makers knew there is a whole segment of America that would otherwise pay no attention to the movie's release because they live in a religious subculture. A subculture that damns everything to hell if it smells anti-religious. Don't you see the irony in that? The marketing itself further segments all Christians into an ignorant group. The true walk-the-talk believers living out of Christian liberty don't need to be segmented into an exclusive group. Perhaps this post is another one full of incomplete thoughts. Possibly. FaithCom Bloggers have another new blog to add to the coalition. "I have put this site together as a means to look at film within a Christian context. Over the years being involved in theatre and film I have seen many Christians react to entertainment media with dismissal. To many Christians, Hollywood is a snake pit whose only purpose is to poison the world. Usually the relationship between Christians and Hollywood is one of mutual spite and irritation. This sour relationship didn’t happen overnight and both sides have reasons to want to snipe at their supposed foe. " Scott has an 8 week class where he teaches how to look at all film from the standpoint of Christian liberty (that's my summation of the class) I took the class this last winter and I can honestly say it has changed they way I watch movies. With Good News Film Reviews, Scott says he aims to blog on the same topics he teaches in class. I am very happy for this good news today. Make sure you add Scott's new site to your FaithCom Blogroll. Skated 20 miles in 1:30 this week (last week it took me 1:50). What a glorious morning it was! Amazing! Cool temp of 64, absolutely clear skies, and I was totally refreshed and ready to skate when I woke up. I skated south on a new route toward River Falls that I had scouted out a few weeks back. Fresh pavement...ssmooooooth! Like I said, excellent skate this morning! I declare my new skates to be 90% broken in - after 5 miles, they fit perfectly. I have been nursing a severe friction point on my left Achilles heal. The annoyance started out as a come and go blister but then turned into a hole big enough to fit a pencil eraser. Now the skin is callousing over and turning into knobby tissue. Thankfully there is not much pain. To the person who helped my purchase the skates -THANK YOU! I still don't know who you are but I prayed for you this morning between mile 12 and 14. God bless you! So I am really happy with my time today. I've been researching more about racing strategies so that I am prepared on race day. I want to keep safe. I want others around me to stay safe. I want to do the absolute best I am able to. I figure my current training will allow me to finish the marathon between 1:40 and 1:30. However, that is by my own power unassisted by drafting and pace lines. Last year I benefited greatly from drafting but I didn't get in a group until after 5 miles. This year I will be in an earlier wave group with better skaters and thus I start drafting soon. I've read that good drafting can improve time by 10 to 20 percent. If that is true, I am looking at a really good finishing time. An hour and thirty minutes looks realistic although I am not ready to declare it a new goal. Last year the winning time for the entire open class was 1:27. Another session of intervals this morning. I cranked out 11 miles with not much major effort. This tells me I need to increase my focus on getting faster as distance endurance will not be a problem this year. I need to key in on the speed bursts during intervals and make them longer with more speed. For example, my best time over a mile is three and a half minutes. That is just over 17 mph - good, but I am shot afterwards and it takes me another two miles to recover. I won't try to increase my speed but I'll try to increase the distance at the faster pace. I would like to string together a five mile leg where I average 17 mph. This is all about leg power and muscle endurance. During the tough parts of training, when I'm whipped, I've thought "Forget this stuff, the real key to unlocking the speed code is to always go downhill." With the latest streak of 90+ temps last week and it being the first week of summer vaca for the kids, our family pool got pounded and the water turned milky by the end of the week. From experience, milky water means pH is too high. So Saturday I am at the Wal-mart checkout with both my arms wrapped around two shock-n-swim packets and a huge container of pH Minus. The checkout person (woman, lady, girl...whatever) looked on with a big smile and shouted out, "Got pool?". I laughed out loud immediately and responded, "Yep, got pool. Ha, got pool, that's a good one." Thinking "Got pool?" was short for "You must have a pool since you are buying all these pool chemicals." She didn't laugh back. She seemed bewildered by my response. She didn't get my acknowledgment of her joke. Got Pool? She wasn't joking. I became embarrassed, paid her and took off out the door. Got Pool? I am still confused. Not sure what that moment at Wal-mart was all about. I thought it was a good joke. Isn't it still? I suppose a joke is only a joke if you intend for it to be a joke. "Got pool? ", "Nope, I've lost 20 pounds in 5 days. Did you know this stuff is a powerful diet supplement. Tomorrow I start dropping next 20." Jean-Yves Blondeau is a human inline skate. In 1994 he configured a body suit of inline wheels and gear so he can skate using his whole body. Nuts! Thunderstorms began cracking at 3:00 AM. Roads were very wet when I woke up at 5:00 AM. I have my own rule that if there are not raindrops actually falling I will skate no matter what. I headed out at 6:10 AM not sure if I'd complete the 20 I had planned. Next thing you know I've rolled over 10 miles, just passed Porter's house, and I was on my way back home. Wet roads make for slick skating- greasy is what it's called. Today's skate was really greasy. The dew point was high as well at 68%. The sweat poured and my 48 oz. of water went fast. I will take it really easy the next two days getting enough rest and quality sleep. Next week I am going to back off on the distance during interval training. Finally, I will increase my calorie intake too in order to refuel - the refueling starts today with Noser's pig roast! Challies nails it about what to think regarding the upcoming Evan Almighty film. No wonder he is writing a book on discernment! Challies.com should be a daily read for all blog readers. And this is exactly why I will not go and watch Evan Almighty. If I go, I know I will laugh. I will laugh at things that are meant to be funny but which are actually dead serious. Only later will I realize what I've done. The genre of film will reduce my defenses and allow me to laugh at things that may be blasphemous or vulgar or otherwise unbiblical. So, like Bruce Almighty, I'll just stay away even though part of me really would love to see this one. Christians are proving that they are ripe for the picking and that they will shell over money for just about any project deemed "Christian." Of course the film's official site has no mention of the programs they've developed for Christians (though they do provide links to environmental programs). The people marketing the film want to have it both ways: they want to market the film to Christians but don't want unbelievers to know they are doing this. They are taking advantage of this Christian market, trying to lure them in to see a film that looks anything but appropriate for Christians. And when people walk away from Evan Almighty they will not love God more. I don't think they will have a greater understanding of the Bible. In fact, I suspect they'll see the biblical story of the flood as being as fictional as this movie--a quaint plot but completely unrealistic and implausible. Mere fiction. This movie will not and cannot bring anyone closer to God. Rather, it will necessarily project a false image of God, a false understanding of Him. And we're being told to watch this, to enjoy this, and to bring our families to see it so they can laugh with us. So, I could see Evan Almighty because I like the lead actor and I know I would laugh a ton. But that is just not a good enough reason for me! I hope my friend and owner of Nehring the Edge sees the movie first thing and delivers the lowdown asap. I can't wait to read his opening one-liner. I couldn't find a review of Bruce Almighty in his archives so perhaps he'll see both movies and give us a "double feature." To Do - 20 miles on Sat. Anyone Interested? This coming Saturday I plan to skate 20 miles for a long and slow training run. I'll be heading out to Porter's house and back (here is the route.) I am looking forward to it...seriously I am! Anyone out there interested in perhaps tagging along with me on a bike - 20 miles is not bad at all on a bike, and you don't have to go the whole way. The session will be over in about an hour and a half. I start at 6:00 AM. Let me know. What is the best comment you can come up with for a man who is considering shaving his legs? Along with road bike racers, inliners shave their legs for health reasons and not for the common myth that it increases speed. The health reasons have to do with better care for road rash (if it happens.) Makes sense, but an even more compelling reason for me is that shaving actually reduces the extent of road rash damage. During a fall, while flesh is connecting with pavement, I've read that leg hair causes enough stopping friction where more skin is stripped off than if legs are shaved clean by a razor. With leg hair there is more road rash damage - deeper flesh stripping. I am concerned about road rash. Last year I fell and suffered greatly for a few weeks. This year I don't plan on falling of course but if I do I don't want to regret that I didn't shave my legs. After proposing a very good reason, are you ok with me shaving my legs? Don't forget to leave your comment. *There may be a prize. Probably. Most likely. More than one entry is allowed. What Matters Most? The One Thing. What is the one thing that you believe you could start doing or the one belief that you could start thinking today that has the potential to dramatically change your life and the lives of those you interact with on a regular basis? "I think I just went through a guy's nose or something." How Quickly the Heart Changes, I Don't Want to Skate. It is 5:46 AM. I have an interval training session scheduled for myself at 6:00 and I do not want to do it. It has been raining out so it is wet and cold. Based on the tree tops bending nearly to the ground it looks pretty windy as well. Add a growing blister on my left ankle to the mix and why would I want to skate and training so hard? But I love to skate is what I remind myself. One of the aspects of training I respect and trust is that you really have to get to know yourself. This could be said of all sports I suppose (and a lot of other things in life.) But I know after a few miles on today's skate, I will be in the zone and feel no pain. I don't mean "know yourself" as in "love yourself and be good to yourself, build your self esteem" I mean to be realistic with who you are - a created human being designed to glorify God in all things. I will skate and do all my activities today for the glory of God. I found this MUST READ blog post through a link from this blog that I subscribe to in my Bloglines - now I've just added another to my list. "If you don’t look at your kids and marvel, figure out what is wrong with you." This may be the longest post I've ever blogged. Read on if you wish. This is the back story leading up to me purchasing new inline skates. My passion for inline skating is growing with each mile I tick off on my "blades". In each of the last two years I've skated the St. Paul Inline Marathon - last year finishing pretty strong in the open class with a time of 1:46. One of the reasons I love inline skating is for the challenge(s) I always find before me. This year, to continue to push for my personal best, I will skate two marathons, St. Paul and Hayward (WI). For most people Inline Skating makes no sense, and to some I am affectionately referred to as "skater boy". No problem, you're all just misinformed. All that to say then, for the time being, inline skating is my thing. I want to see how far I can go with it. If I can't be passionate about it and act as if (I'm a pro) then why do it? I am passionate about something else much more magnificent than the joy of inline skating. I care more about Another than the physical accomplishment of rolling over 26.2 miles. Let me put it this way, I want to glorify God with my life more than I want to breathe. This is a growing passion. I care more about the reign of Christ in all of life over all the earth for His glory more than I care about skating. I want to see and personally affect the advancement of God's kingdom with my life. I try to pursue Christ's reign in my life but I do it imperfectly and it is only by grace alone that I even come close. I am a sinner through and through sustained daily by God's sovereign control over everything. I've been convicted and I've shifted my affections toward eternal ends and God's glory. This is not just religious speak and God talk, I really sincerely believe Jesus Christ is King of my life today and certainly of all peoples, past, present, future and it will be this way for eternity. What does this post now have to do with inline skating? Everything! Start from the beginning if you have to but here is the just of it - God is glorified when inline skating (and everything related to it) is treated as gift from Him and not an idol. I skate because it brings me great joy but it is not primary in my life - that is what makes it so much fun!!! I am free! I am free to pursue excellence in inline skating because my heart is clean of the sinful desire to compete and skate so that I feel better about myself or so that others think better of me. I am free indeed! The day before receiving the $150 anonymous gift I had quite the internal battle going on in my heart. I spent most of the early part of the day dreaming of new skates. Don't forget, this was the day before the gift. As the day went on my heart slide further into covetousness, jealousy and a no-holds-barred selfish poor me attitude. I really wanted new skates and believed by the end of the day there really was no point in training and doing my best because my current skates where not good enough. In days past I would have purchased the skates on a stop after work before going home. Without regard to the consequences I would have wrote a check, took money from the cash machine, or threw the credit card out for a swipe. Problem solved, desire met. I got over those days though. I turned to having more outside control of my spending sprees driven by my own greed to waiting until my wife said it was ok to buy the skates. But, you see, she waited as long as she could, or let me say, she endured my childish pouting as long as she could. For a while I became good at manipulating her to get what I wanted and spending what I wanted on the things only I could benefit from. At this point I suspect there are some reading that see this story merely as a case of a severely immature person who needs to grow up and stop being so selfish. That is what I used to think of myself as well. I believed all I needed to do was "stop it" and change my behavior. I could do it myself. On the day before I received the anonymous gift the temptation to go home and "discuss" my "need" for new skates with my wife was very strong. But there was another competing desire I recognized as the day went on - to love my wife, provide for my family, and glorify God. This desire, to glorify God, was not new that day, obviously, but rather what I noticed was that it was very strong and offered more promise than all other things in my life at the moment. To say it another way, I preach how I want to glorify God with my life and at that moment I sensed I had a real opportunity to honor God by not saying anything to my wife. I also sensed how hard that was going to be for the evening. At that moment I gave up my dream of new skates. I gave up the desire. I know this may sound really crazy, but in my heart I surrendered my control over the whole situation. Usually people do this kind of surrendering when addicted to drugs (been there) or while undergoing great troubles in life (been there too) but I was doing it about a pair of inline skates. No, not really, I was doing it with an idol of my heart. That idol was lust - lust for what I wanted and had to have. Compared to lust, I recognized how much I loved my wife and I saw a real everyday opportunity to glorify God by responding in faith. What did I have faith in? That God would provide? No. I had faith in the goodness of God. I had faith that God is who He is and I am his creature. That's it. Glorifying him by loving my wife by not saying anything to her was what I really wanted to do more than anything else. Remember, this happened the day before the gift. I find it amazing that at the same time God was also, most likely, preparing the heart of the giver of the anonymous gift. God, bless that person, I pray! What is so significant about the gift is not that I got new skates, it is the praise my heart lifted up to God as soon as I realized what was going on. You see, the meaning and purpose of the whole previous day became clear the instant I understood the gift. I had nothing to do with it. I followed no formula for success. I did nothing. I did not name it and claim it so to speak. I didn't obligate God to come through for me. This was a pure all out gift from God! What makes the gift great is the connection it has to the events of the previous day. I will always skate in my new skates with this meaning in mind - those skates are special to say the least!! Here is another perspective of this whole thing that grips me. I've always struggled with money. Never having enough. Bad decisions. Four children (they are not bad decisions!) That morning during the brief walk from my car to the house I thought about using the $150 to pay down some of the bills I have outstanding. Dentist, doctor, clothing, taxes. No doubt, I knew my wife would agree - it is more responsible to pay down those bills. But we talked, and I did not manipulate. We both had to answer the questions. Why would God allow me to get skates while we had so many other bills to pay? Why didn't we get a gift that said "Get your daughter's teeth fixed. ", or "You and Carla have worn that same summer clothes for the last three years, it is time to upgrade!"? Why would he give me something I want instead of something I need. We concluded, in providence, God worked in the giver's heart to give me money for new skates. 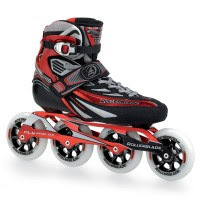 Now, my want of getting new skates became a need to get new skates because God is glorified by it all! He made everything happen in his perfect timing and by his perfect plan of love. You may not understand. You may think I am super-spiritualizing this. I am not. This gift has changed my life. I still don't think this blog post does justice to what really went on in my heart, but I tried. This gift and what lead up to it displays the reality of God's hand in my life and the miracle is - I HAD NOTHING TO DO WITH IT! This gift is but a reflection of the ultimate gift of Christ's death on a cross and the eternal hope that is found in His life as the resurrected Son of God! I skated 17.5 miles yesterday. Click here to see the route. The whole thing lasted 1.5 hours but the first 30 minutes was really slow as I worked out the pressure points from the new skates. The last hour though I averaged 14.5 mph. The new skates were fantastic! Yesterday at 7:00 am I just pulled into my driveway from a 45 minute interval training skate - chalk up another push-the-cardiac -threshold-to-the-max session. I was satisfied with my effort and pleased to move on with my morning. What happened next was simply one of the greatest positively shocking moments I've experienced in sometime. Before going into the house I decided to pull the garbage container out to the end of the driveway. I noticed an envelope with my name on it wrapped in baggie sitting underneath the windshield wipper of my car. My first thought was it is a thank you note from my neighbor for helping her trim her long grass last Saturday. However, the note inside said "Heard you need a new set of wheels. Good luck with your races." I discovered a $50 bill as I rolled open the last crease of the note. My second thought was Wow! Yep, $50 will definitely help the purchase of actual race wheels. But then, as I was folding up the note my eyes attended to the item that slipped out and floated to the ground. It was a $100 bill! Right then I realized the meaning of the note - someone gave me $150 to help purchase a new set of wheels as in skates! AMAZING! TRULY WONDERFUL! I purchased the skates yesterday. I get to skate in them after noon today . I've had to wait for the custom fitting to settle in the last 24 hours. Stay tuned for the back story as to why this is so much more than me getting new skates.